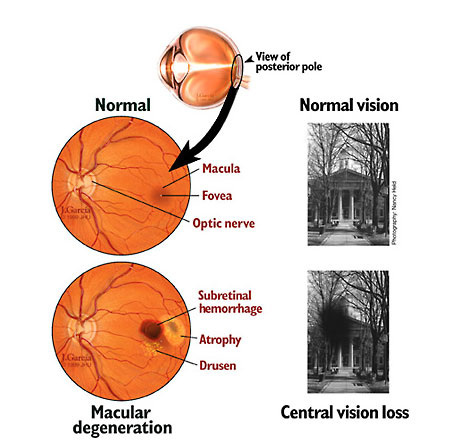 Age-related macular degeneration (AMD) is the leading cause of severe, permanent vision loss in Americans over 50. More than 3.5 million people have early stages of macular degeneration. This disease of the macula, the central and most sensitive part of the retina, robs people of central vision. Left with only peripheral vision, they struggle to identify faces, read books and watch TV, because they can see out of the corners of their eyes, but not straight ahead. About 90 percent of people with AMD have the "dry" or nonvascular form, which usually progresses slowly and may even stop advancing for long periods of time. Thus, although AMD is irreversible, many patients keep most of their vision. However, the "wet" or neovascular form of the disease, caused when tiny blood vessels at the back of the eye grow uncontrollably and leak fluid, can scar the macula. This may cause loss of central vision within days or weeks. Also, the wet form may strike those with the dry form at any time. Because AMD - especially the wet form - is relentless in its assault on vision, early diagnosis is critical. Wilmer has developed a new laser technique to detect the early stages of AMD, when the growth of new blood vessels is not yet visible by other means. Laser techniques not only help diagnose patients now, but also may be used in the future for laser-targeted drug therapy. This promises to make medication more effective by directing it precisely to specific areas of the retina. Currently, laser therapy to seal off diseased blood vessels in the retina and slow the disease is performed. Surgeons also are conducting a clinical trial to test the safety and efficacy of a new type of surgery to treat AMD. In addition to surgery, doctors use special dyes to detect and treat AMD and utilize the investigational enzyme chondroitinase to prevent macular holes from enlarging during surgery.